last May we discussed how the different types of stocks and neckcloths were worn in the nineteenth century. Today we’ll talk about another important fashion accessory: footwear. Boots, half-boots, shoes.. there were several styles of footwear fashionable men could choose from and they all had different advantages. Let’s take a closer look at them, shall we? is a boot only worn with tight pantaloons, a fashion entirely copied from the military, and is very common in Germany and France, where it generally forms a part of equipment in the cavalry. Of late years, however, this kind of boot has been introduced among our own military horse. Latterly it has become very popular in riding, for which it is excellently qualified. In undress it is impossible to dress a fine leg, more especially of a short person, to greater advantage than in a Hessian. Hessians are a very expensive wear, and, like almost all other manufactures in the present day, may be superbly worked and finished, being bent and creased in the most exquisite manner, without ever losing shape. That kind of shape most admired, when pulled on the leg, should be high enough to let the tassel touch the knee-pan, and then be lowered to the calf, when the dents will form fuller and much handsomer than when contracted and held in, which latter way causes the boot to sit stiffly, and want that elastic spring in the leather that the method I point out possesses. is almost entirely a sporting fashion, and boasts scarcely of any difference in make, with the exception of the top. 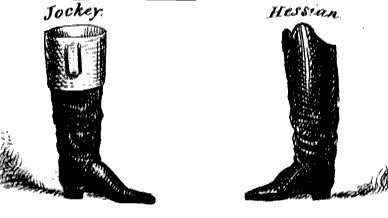 Although they are worn by noblemen and gentlemen occasionally in hunting, they are in general use among the lowest orders, such as jockeys, grooms, butchers, &c. This style of boot when worn should only be with drab or white corded breeches. Spirits of vitriol mixed with a little fine powdered pipeclay, will be found an excellent cleaner of the tops, which should always be spotless. together with the following, are the only boots in general wear; to be any thing like the fashion, they should have the toes at least an inch and a half square – such being the custom for both boots and shoes. Like the boots above mentioned, these are commonly made of calf-skin, though among the ton, for the sake of expense, doubtless, Spanish leather is used. This, I think, except in dress shoes, for which it only is qualified, should never be used; as it never possesses a quarter the jet brilliancy well polished calf-skin can boast; while, in point of wear, it is far inferior. I have observed this boot under the denomination of dress, not of long invention, that is worthy of some notice under this head, and which certainly is an excellent substitute for dress shoes. I wish to be understood, I do not here mean ball-room dress, but dinner dress. In the entire shape of a Wellington boot, uncovered by the trousers, they present the exact image of a shoe with the trousers over the instep. The stocking is effected by black cloth or India rubber in appearance, which is introduced under the sides and top of the leather part, resembling the shoe, as in the annexed figure. This boot is invented, doubtless, for the mere purpose of saving trouble in dress; for without attending to silk stockings or the trouble of tying bows, you have merely to slip on the boots, and you are featly equipped in a moment. But the great advantage this boot offers to many I shall proceed to unfold. It is particularly applicable to those who wish to heighten their stature, a thing this will enable them to do in any degree that an undress boot will admit of, by having high heels. These can be two or even three inches if required; only two things should be observed: when they are very high, the aforesaid heels should be tipped with cork at least half an inch in thickness, so that no more reverberation need be made than with a pump to screen them completely from “human ken;” the trousers should be made very long, even to touching the ground, and strapped. are a half-boot, one and the same, with this difference, that the former laps over the front and ties; whereas the other does not tie or lap over, but a piece is cut out from each side, which enables it to be pulled on by the tops before and behind. These boots, for summer wear, while equal in appearance and durability with Wellingtons, are much more comfortable, confining the ankle less, and are so much easier put on. In price, too, they are much more economical, and equally fashionable in make; the only real difference between them and the Wellington is, that the latter takes more leather for the tops and lining, as well as additional work, which renders them much dearer. can only be divided into two classes, long quarters and short quarters, that is dress and undress; the dress being generally termed pumps, and are always adopted in full evening costume, as being absolutely indispensable to etiquette. These should always be made of Spanish leather. In the present fashion, which is very well contrived for showing off the feet, the sides of the shoe should not be above an inch and a half high, and the leather not proceed above the same height over the toe; only, in fact, just sufficient to keep firmly on the foot. The tie should be of broad ribbon, made into a small double bow. Buckles are only used in the army, navy, and marines, and should be set with brilliants.